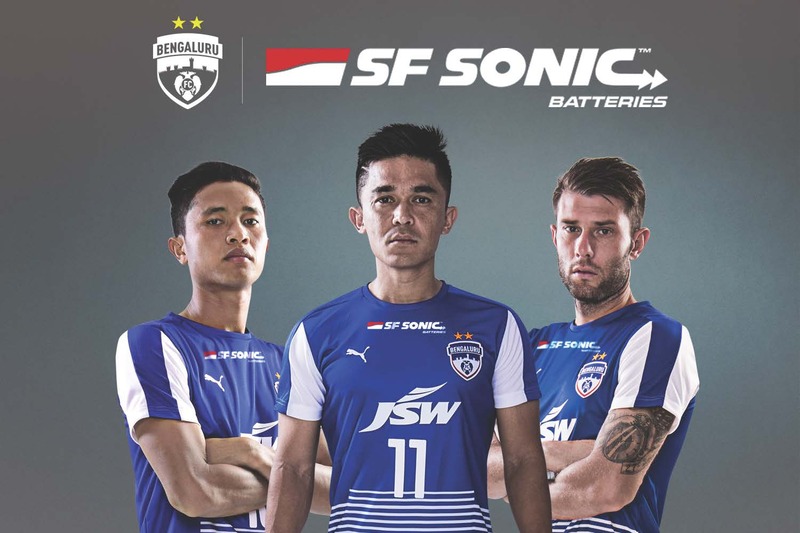 The leading name in lead acid storage battery, SF Sonic announced its brand association with the new entrant to Indian Super League (ISL) – Bengaluru Football Club (BFC) by becoming its Power Sponsor for the season 2017-18. During the season, spanning 18 ISL matches, all the three versions of the BFC jersey will carry the SF Sonic logo prominently on the front. “We are happy to associate ourselves with Bengaluru FC which is one of the up and coming football clubs in the country. Much like the SF Sonic brand which through its youthful vibrancy exudes power for Indian roads, BFC, within a short time of its entry into the Indian football scene, has established itself as a leading club of the country. Although it originates from Bengaluru, the club now has a national following,” said Mr. Subir Chakraborty, Director Auto, Exide Industries Ltd. SF Sonic is one of the leading automotive battery brands owned by Exide Industries Ltd.
During the 18-match tournament, which will be played across the nation in several cities, the SF Sonic brand plans to leverage its brand salience through various digital marketing endeavours on its digital channels, including contests on Facebook and Twitter. SF Sonic will be also creating content centering around the popularity of BFC and SF Sonic on its website. SF Sonic’s offline activities include in-stadia branding, POS activities, and on-ground activations. SF Sonic, with its unparalleled power and superlative quality, has by far been the most prudent choice for Indian roads. Creating a benchmark for automotive batteries, it has so far testified the drive of the age. It captures the pulse of a whole new generation that believes in reaching their dreams and successes at supersonic speed with the core philosophy that revolves around always keeping you ahead.